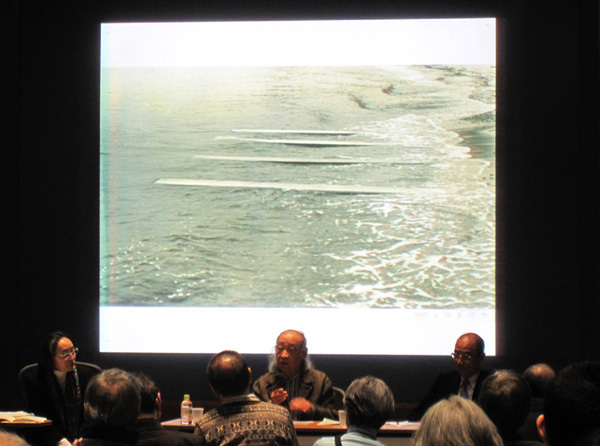 In 2015 March the 7th, "Talk Session Artists and Archive: Over《Land and Sea》(1970)" was held. JCRI participated in this event as a collaborator. 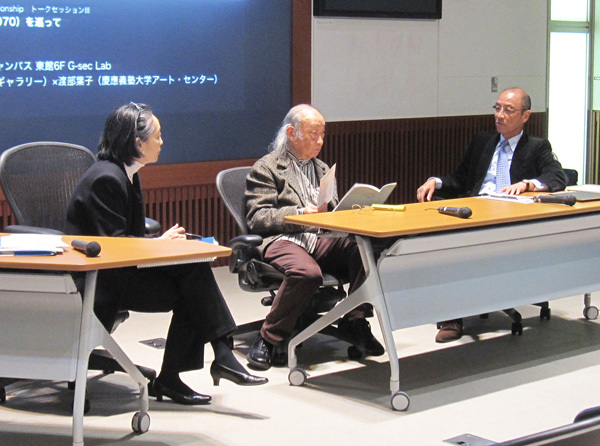 Tatsuo Kawaguchi, who is a modern artist, Yoko Watanabe from Keio University Art Center and Shigeru Yokota from Shigeru Yokota Gallery participated and discussed over《Land and Sea》, and "10th Japan International Art exhibition Tokyo Biennale' 70 (Between Man and Matter)" (hereinafter called Tokyo Biennale). Tatsuo Kawaguchi is one of the representative modern artists of Japan. From 1960s he began putting his works out in the world and worked on the theme, "relation". He continues to creates his work with a constant attitude which floats up the "relation" between "material and material" or "relation" which is unseen between human and materials using metals such as steel, bronze and copper, energy such as light and heat and furthermore various materials such as fossils and plant seeds. 《Land and Sea》is a photographic work which was taken in Suma Beach in Kobe in 1970. More than 130 photos were taken then, and 26 works out of them were selected and exhibited in "Tokyo Biennale" other works except these 26 photos were discovered by the Shigeru Yokota Gallery. Tatsuo Kawaguchi and Yokota met in 1975. When Kawaguchi's first solo exhibition was held at Minami Gallery in Tokyo, Kusuo Shimizu introduced Yokota to Kawaguchi. After then, the first solo exhibition was held in 1983 at the Shigeru Yokota Gallery and thereafter, 16 exhibitions in total were held. When opening an exhibition in 2011, works of 1970s were lined up and listed up in order to foresee how his works would be taken as a whole. Then, works of driftwood and scrapbooks of《Land and Sea》was discovered. When works of 《Land and Sea》was request to be exhibited in the photo exhibition "For a New World to Com: Experiments in Japanese Art and Photography, 1968-1979", which travelled to Houston Fine Art Museum opened from March 2015, more than 100 pieces of photos except from 26 pieces presented in Tokyo Biennale were discovered from Kawaguchi's studio. 26 pieces which were exhibited in Tokyo Biennale were well framed. However, pieces which were hidden at the back of these pieces were considered to be equally very important, hence rediscovered pieces are exhibited from March 9th to March 20th after the talk session at Shigeru Yokota Gallery. In this occasion, we were able to have Yoko Watanabe curator and professor at Keio University Art center write on "Talk Session artists and archive: 《Land and Sea》(1970)" For details, see "Thinking archives".